This past year two trees have fallen across the trail, and in some kind of freak coincidence they were both at head level (see pic of the 2nd one). 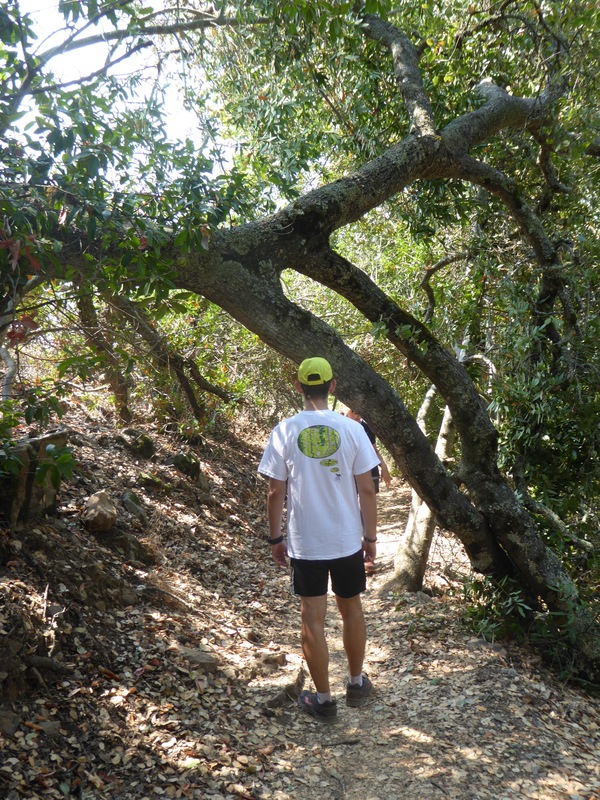 As you can imagine, this presents a particular hazard to hikers — and especially runners. 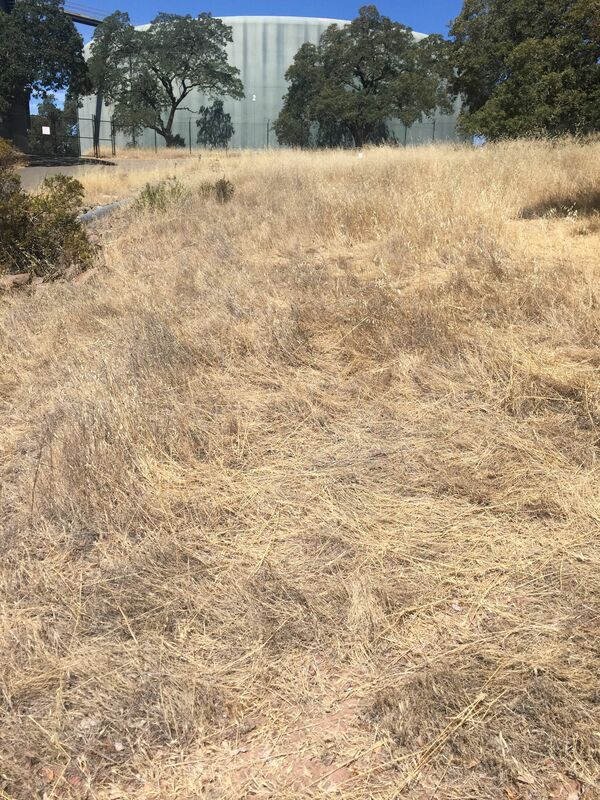 Thankfully, the City of Sonoma Public Works Department has been very good at responding quickly to these situations, and in both cases were able to remove the tree within a day or two of it being reported. We are sincerely thankful for this, as the volunteers who do much of the other maintenance of the trail do not always have the necessary equipment and skills to deal with a large fallen tree. So although the group of volunteer stewards are responsible for many of the smaller maintenance activities, such as cutting channels to move water off the trail as quickly as possible, some of the larger, more complex tasks require City staff involvement. The City of Sonoma owns the property, as they also now do for the contiguous Montini Preserve, so this makes sense. This is a great example of collaboration between volunteers and the City to maintain a safe and enjoyable trail experience. 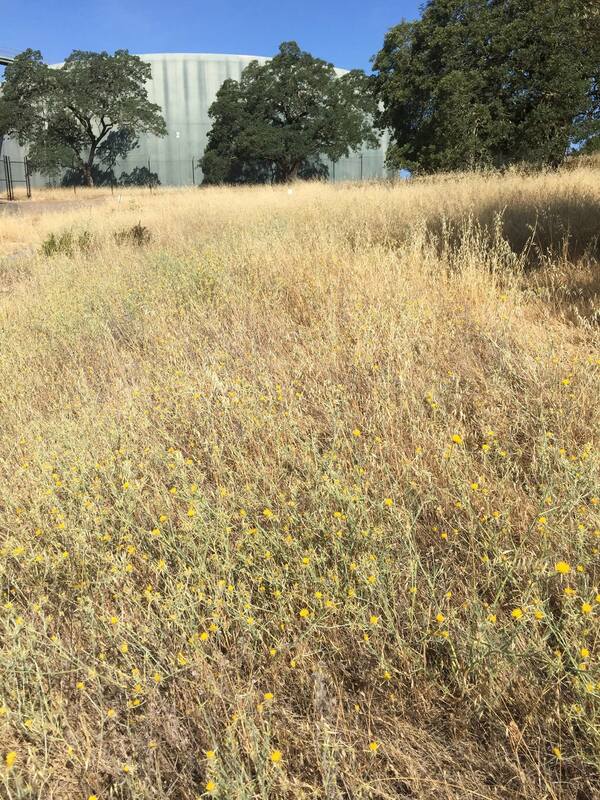 Earlier I posted about starting the yearly battle with Yellow Star Thistle (YST). YST is an invasive non-native weed that left unchecked can take over entire meadows (it does not do well in shade). The University of California has this to say about it (in part): “Seed output can be as high at 30,000 seeds per square meter, with about 95% of the seed being viable soon after dispersal. Most seeds germinate within a year of dispersal, but some can remain viable in the soil for more than 3 years.” This is an opponent that is difficult to over-estimate. 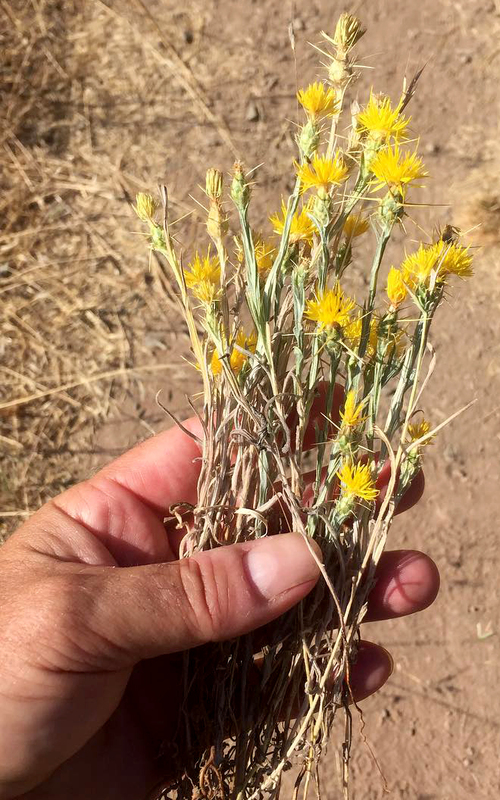 Volunteers are trying to eradicate this plant all over California every summer, as we certainly do here at Jack London State Park (thank you Linda Felt and other volunteers!) 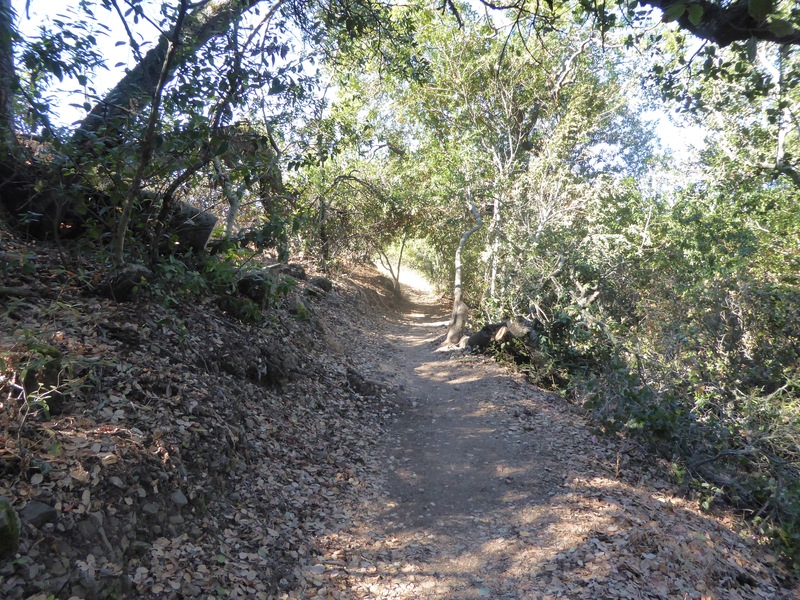 and on the Sonoma Overlook and Montini Preserve properties. So we are now in the second year of a relentless 5-year campaign to completely eradicate this scourge. Starting in mid-May, even before it was blooming, I began pulling it on my hikes on Overlook and Montini. Since then I’ve been putting in several hours every week pulling it up by its roots and hiking it out. When tackling a large patch I take a large plastic sack, but recently on the Overlook Trail I have been finding so little (see the picture of a recent haul) that I haven’t bothered to take a bag. Over the summer I’ve racked up at least 30 hours of pulling — not counting the time to get to the locations. Last year we did such a thorough job on the Overlook Trail that this year it took much less time to keep it in check. The Montini Preserve was another matter, as we hadn’t been checking it last year (it opened to the public in November). I found several significant patches and one really bad patch (see the “before” picture to the left, it covered the entire area pictured and beyond). I was able to get the smaller patches under control with some diligence, but the really bad patch has taken many hours of work spread out over weeks. Only today did I finish clearing this patch (see “after” picture). It’s sweaty work, and raised blisters on my hand even with a glove. I can now report that as far as I can tell, YST has been effectively removed this season from the main parts of the Montini Preserve and the Sonoma Overlook Trail. One morning recently I arrived at the really bad patch on the Montini Preserve with three large plastic sacks that I intended to fill, as I had several times before. I surveyed the patch that I had been working on for weeks and saw everything that still remained. I thought about giving up. I had made a lot of progress and I thought we could get it all next year. Why not just quit? No one would know. I took another look around. Then I stooped down and began to pull. Call it what it is — an obsession.